In the triumvirate of the Italian bel canto opera composers – Rossini, Donizetti, Bellini – it was the ‘gentle Sicilian’ Vincenzo Bellini that captured the imagination of the later Romantic composers like Chopin and Wagner. Bellini’s sweet, simple melodies are full of gentle pathos and, when called for in a dramatic scena, great rhythmic vigor and searing passion. One could hear the Bellinian influence in Chopin’s Ballades and Scherzos, and Wagner’s Liebesnacht love scene from “Tristan und Isolde”. 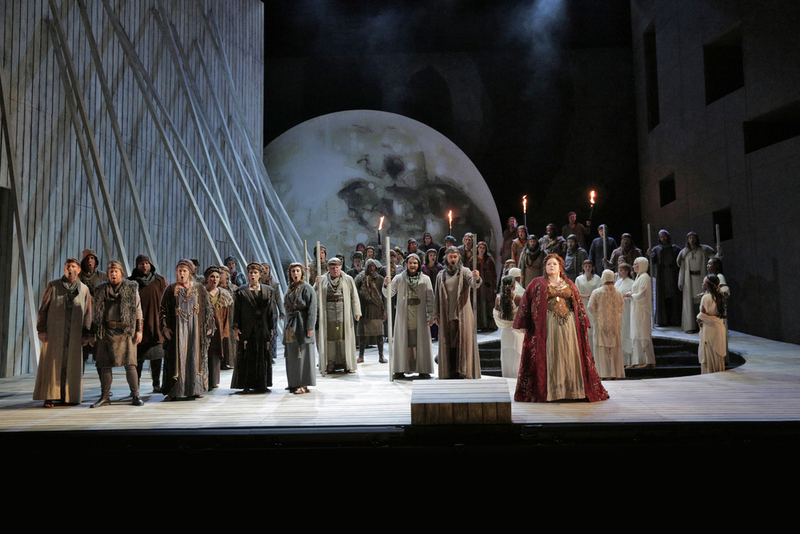 Of the ten operas Bellini gifted us, “Norma” is probably the finest example of the quintessential Bellini style, and also the most challenging to stage owing to the formidable vocal demands of the title role. Enrico Caruso’s famous remark about “Rigoletto” needing ‘four greatest singers in the world’ also applies to the bel canto operas, which by definition are all about great voices, much to the chagrin of conductors and composers. From Bellini’s letters and contemporary reports, we learned his frustrations working with vain singers to try to get what he wanted. In the case of “Norma”, everything went smoothly until the opening night of 12/26/1831, when the cabal of a rival composer caused a near-fiasco and a nervous breakdown that probably hastened Bellini’s demise four years later. Fortunately, the second night fared much better (the cabal having left) and “Norma” went on to become Bellini’s biggest success to date. Being a stickler for detail, Bellini made it known exactly what he wanted in the lead roles and engaged the singers capable of filling them. In the 1831 premiere cast were soprano Giuditta Pasta as Norma and soprano Giulia Grisi as Adalgisa. Based on what we know about Pasta and Grisi, we can infer that Bellini valued dramatic utterance more than vocal perfection in the role of Norma, whereas the role of Adalgisa should be vocally pure and flawless. In modern times, a perfect match would be Maria Callas as Norma and Joan Sutherland as Adalgisa (in the famous 1952 live recording from Covent Garden conducted by Gui). In the imperfect world of 2015, and after a near 20-year hiatus, the Los Angeles Opera was able to mount a production of “Norma” that not only sounded great but looked good, too. Soprano Angela Meade and mezzo-soprano Jamie Barton reprised their 2013 Met performance here with easy rapport and great vocal chemistry. Their moving duet in Act Two ‘Mira, O Norma’ was a marvel of harmonization in thirds and sixths. In the role of Norma, Angela Meade commanded a strong coloratura soprano voice with brilliant highs and deep, chesty lows. As coloratura sopranos go, Ms. Meade is no nightingale, but an eagle ready on the attack to protect her young. Her voice took about half of Act One to warm up – Norma’s celebrated aria ‘Casta Diva’ was sung at half voice (mezza voce) and a bit shaky until the climactic swell on the words ‘che regnar tu fai nel ciel’ (you Goddness who reigns in heaven) with a ringing high-A on the word ‘fai’. Once fully warmed up, Meade’s powerful voice was capable of unleashing a torrent of emotions – fury at her betrayal by Pollione in the Act One Trio finale (‘O, di qual sei tu vittima’), threats of revenge in Act Two duet (‘In mia man alfin tu sei’/ ‘you’re in my hand at last’), and tender pathos in the opera’s finale (‘Deh, non volerli vittime’/ ‘don’t let my kids be victims, take care of them’). Opera is a 400-year-old art form with long and often rigid conventions and traditions; Ms. Meade can unapologetically consider herself a worthy Norma alongside her illustrious Druid predecessors. The original Adalgisa, Giulia Grisi, was also a soprano, unlike the mezzo-soprano favored in the role today. Presumably Bellini had wanted two sopranos so that Norma and Adalgisa would sound sisterly together. Jamie Barton, although a mezzo, has the vocal timber of a lyric soprano and did indeed sound sisterly with her Norma. Tenor Russell Thomas as Pollione, the two-timing lover of Norma and Adalgisa, boasted a powerful tenor with ringing high C’s in the fine tradition of Giuseppe Di Stefano and Franco Corelli, two great Polliones of the past. Also notable was the firm, authoritative bass of Morris Robinson as the high priest Oroveso (and Norma’s father). The Los Angeles Opera Chorus handled their Druid prayer and war duties with equal panache, culminating in a blood-curdling ‘Guerra guerra’ war cry in Act Two (which, incidentally, was sung at many 19th-Century rallies for Italian unification). One striking feature of this “Norma” production was the non-singing roles of the young Druid maids played by dancers and choreographed by Barney O’Hanlon. The Act One curtain went up during the coda of the overture (perfectly timed!) to reveal the dancers performing a Druid rite at the altar. The lithe dancers also accompanied Norma in her many outings, including striking the gong to declare war on the Romans. The simple, economical sets and costumes were handsome, effective and served the drama well. The unit set featured a Druid altar on the right, a military rampart on the left, and a ‘super moon’ looming in the background that changed to blood red in the finale. For the indoor scenes, a long sheer white veil dropped down from the ceiling, transforming the altar into a bedroom chamber. Conductor James Conlon was formerly Music Director of Opera Bastille in Paris and knew a thing or two about conducting singers. Unlike most operas where the music tends to overwhelm the singers, Bellini’s thin orchestration presents the opposite problem of not enough support. It’s the conductor’s job to ratchet up the excitement and set the ‘gentle Sicilian’ on fire, and maestro Conlon did exactly that. The tempos were uniformly brisk with heart-pounding pizzicato strings and meltingly beautiful flute and oboe. Bel canto operas may be all about great singing, but having a great orchestra is extra icing on the cake. Two more performances of “Norma” remain on Thursday 12/10 and Sunday 12/13.